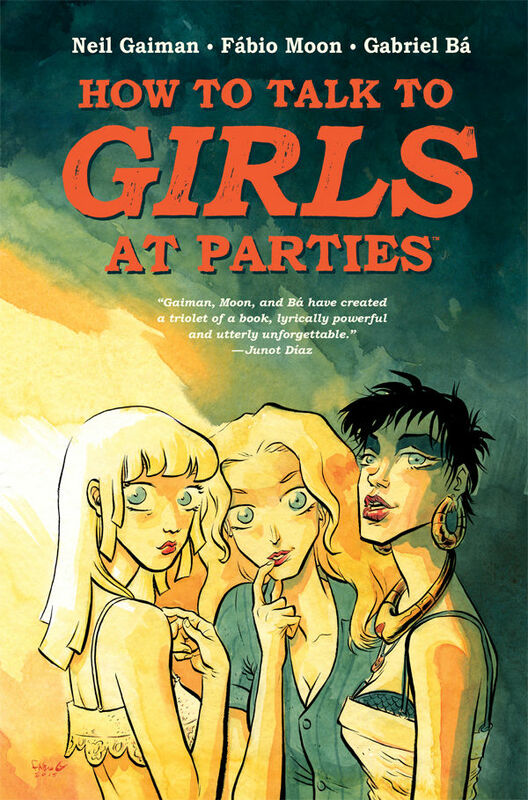 How to Talk to Girls at Parties began its existence as a short story by Neil Gaiman, but last became a graphic novel adapted by the brilliant Brazilian twins, Bá and Moon. The story is about Enn, a fifteen year old who finds that it's very difficult to talk to girls, a problem not shared by his best friend, Vic, who is very good at this. Vic drags Enn to a party he doesn't really want to go to, and they are both blown away by the beauty of the girls there, especially the one they think is the hostess. As Vic spends time with her, Enn wanders the house, and has a few increasingly strange conversations with some of the girls who are not busy dancing. It doesn't take long for the reader (although it takes a lot longer for Enn) to figure out that there is something very odd about these girls, perhaps even something otherworldly. Bá and Moon are stunning artists. I didn't really buy Enn or Vic as fifteen year olds, but aside from that, I love how they construct these scenes and build character through facial expressions and body language. This is a good quick read, although I have to say I'm happiest when the twins are writing the stories they draw. I think it's time for them to give us a long-form story like their Daytripper, which remains one of my all-time favourite comics.